In this post I go over what RAM is, the origins of RAM, the different types of RAM, and how much RAM you need for your setup. RAM stands for random access memory. It is used specifically to hold data for applications that are currently running, including your operating system. So when you load up your favorite app, the Operating System loads the application from the hard drive into RAM. Unlike RAM’s cousin SAM (sequential access memory), applications can access the data in RAM by address, allowing for much faster speeds than going through each byte sequentially until it gets to its destination. RAM is most commonly seen as small rectangular chips that can be connected directly to the motherboard of a computer. Not sure about motherboards? Here is a link to a blog post where I go over motherboards. What Is The History of RAM? There were several forms of RAM before the RAM that we know of today was invented. The first version was actually an electrically charged tube, or a CRT (Cathode Ray Tube) invented in 1947 by Freddie Williams and Tom Kilburn. This device was referred to as the Williams-Kilburn tube. Original… I know. The tube was eventually able to hold 256 bytes of data for a period of a few hours. That is a little more than enough to store the following quote from Steve Jobs in UTF-8 encoded text: “Technology is nothing. What’s important is that you have a faith in people, that they’re basically good and smart, and if you give them tools, they’ll do wonderful things with them.”. 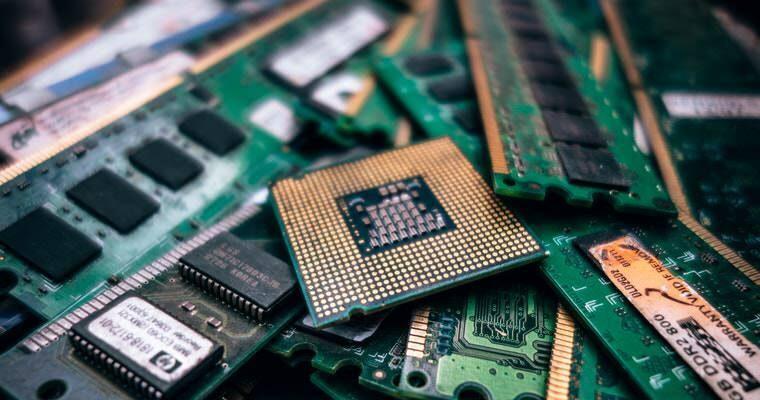 The second version of RAM called Magnetic Core Memory also was also released in 1947, but it wasn’t until 1968 that the RAM we know of today was invented by Robert Denard giving us Dynamic Random Access to our memory. What Types of RAM Are There? Nowadays there are so many different terms to identify RAM, that it can be extremely intimidating. The current standard tends to be DDR3 RAM. We have DDR4 RAM, but as of the time of making this video, DDR3 is still currently the most common, due to the higher cost of manufacturing DDR4. Modern RAM is what is known as DIMM or Dual Inline Memory Modules. This is the successor to its predecessor SIMM or Single Inline Memory Module. The main difference is that DIMM has pins and chips on both sides of the RAM stick giving it twice the capacity. Modern RAM also belongs to a group called SDRAM which stands for Synchronous Dynamic RAM. Originally, DRAM had its own clock speed that was independent from the computer’s processor. DRAM wasn’t ideal for the evolution of modern systems, so SDRAM came out of this allowing the RAM to be synchronous with the CPU’s clock speed. So when you go to the store and purchase a new Desktop, you’re almost certainly going to have DDR3 DIMM SDRAM. But what about a laptop? Laptops use a shorter version of DIMM called SODIMM. The SO simply stands for Small Outline. There are many other types of RAM to talk about such as ECC, Parity, Buffered, etc, but these are more advanced topics for a future video. RAM is easily upgradeable for a reason. As technology progresses, the need for more RAM storage increases as well. Back in the good old days of Windows 95 you only needed 4MB of RAM to get by, now in the world of Windows 10 the minimum is 2GB for the 64 bit version. That is about 500 times more storage than Windows 95 required. 2GB is enough to install Windows 10, but you need a lot more if you want to run apps such as Photoshop, use a modern web browser, or play games. For a user who plans to only use their computer for checking email and browsing the web you can get by on 4 GB. If you create and edit documents or perhaps create presentations using software such as Microsoft Office, you’d be better off with at least 4-8 GB. If you do graphic design and/or amateur video editing you’ll want 8 all the way up to 32 GB for software such as After Effects. For more advanced uses and gaming you’ll want a minimum of 8 GB, but you’d be much more comfortable with 16 or more GB. As you can see, if you’re unfamiliar with the inner workings of a computer, purchasing RAM can be pretty intimidating. Crucial has put together a pretty nice RAM purchasing guide on their website, link in the description. I would recommend using their purchasing guide if you’re going to purchase online, otherwise sales associates at stores such as Best Buy will be able to point you in the right direction.